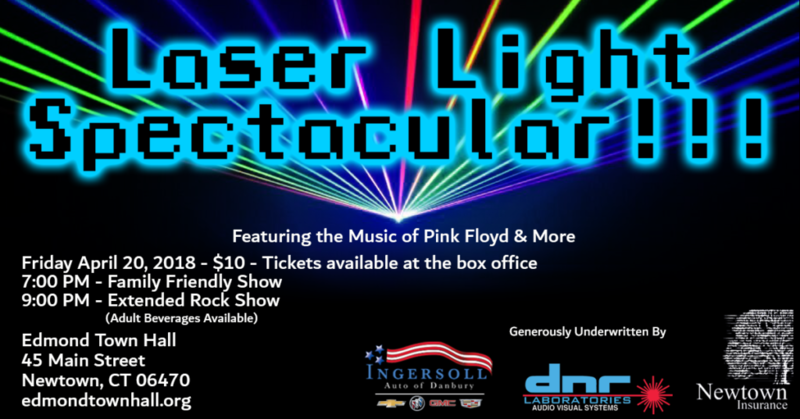 Edmond Town Hall will host two performances of a Laser Light Show Spectacular on April 20, 2018 at 7 pm and 9 pm. This fundraiser is made possible through sponsorships form DNR Laboratories, Newtown Insurance and Ingersoll Auto of Danbury, with 100 percent of ticket sales going directly to Edmond Town Hall for restoration of its historic theatre. There will be an artistic installation of eight high-powered digital laser beam projectors and animation projectors accompanied by music. The show will feature animated pop culture music on the theater’s 30-foot screen and a colorful display of laser beams overhead. There will be two performances. The 7 P.M. Family-Friendly Show will be 45 to 50 minutes long and will include familiar pop music appropriate for ages 5 through adult. The 9 pm Extended Rock Show will be 60 to 70 minutes and will include rock music from Pink Floyd, Moody Blues, U2, The Doors and Led Zeppelin. Concession will be available at both shows. Beer and wine will be available for purchase at the 9 PM show. Tickets for both shows are $10 per person and may be purchased at the door or online by clicking here for FAMILY FRIENDLY SHOW . For the EXTENDED ROCK SHOW click here or go to the Edmond Town Hall Facebook page. “While we have improved projection and sound in recent years, we are hoping to tackle lighting next,” said Margot Hall, chairman of the Edmond Town Hall Board of Managers. We are grateful for the generosity of our sponsors and the support of our community through residents and through many people and organizations including Newtown Arts Commission, Jennifer Rogers, Hayden Bates and others who have donated their time and efforts so that we can continue making improvements to our historic theater. The Edmond Town Hall, completed in 1931 and listed on the National Register of Historic Places, was a gift from Newtown benefactor Mary Elizabeth Hawley. It has served as the center of the community since its inception by providing generations of residents and neighbors with governmental services space; affordable family entertainment through its theater; sports opportunities in its gymnasium; and, elegant space for gatherings, fundraisers, civic events or to celebrate life events.